What’s a girl to do when she gets a craving for a simple vegan cookie with a subtle banana flavor, but all recipes she sees on Pinterest are not exactly what she wants? Get to experimenting, of course! 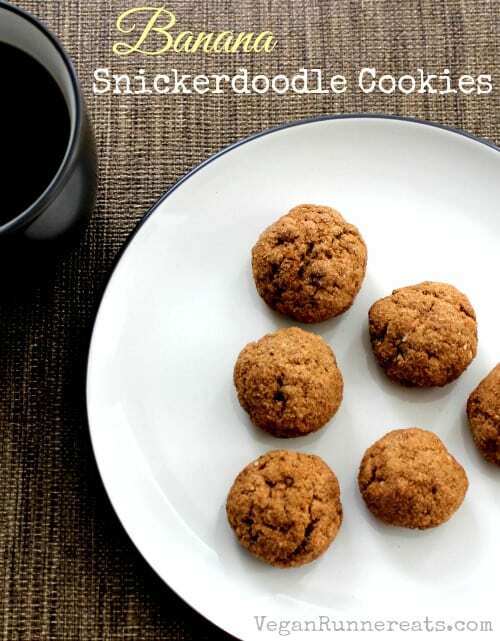 This happened to me a few weeks ago: I decided to make a batch of snickerdoodle cookies – classic American cookies that are coated in cinnamon sugar before baking – but couldn’t find a recipe I liked. Most search results brought up recipes with at least some oil or margarine, and as you know, I try to stay away from those things if I can. So I decided to mix the ingredients that I already had on hand, guided by a thought, ‘How bad can it possibly turn out?’ I used a few tips from some of the recipes I found. One of those tips didn’t work out exactly as planned: the recipe suggested rolling the dough into little balls to let them spread and flatten during baking, but I overlooked the fact that this would only happen if there was some oil in the dough (mine didn’t have any), so my snickerdoodles remained neat little balls 🙂 That didn’t upset me though – who says that cookies always have to be flat? When Rob saw my creations, he called them ‘snickerdoodle munchkins’ – I’ll take that! 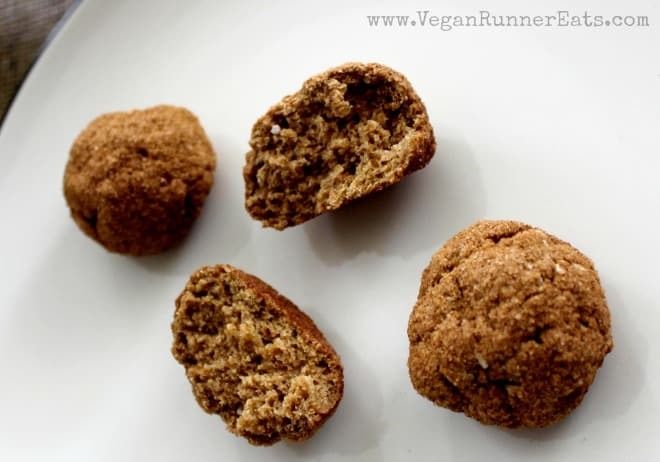 The point here: it’s up to you to either leave these cookies as balls to make them look like munchkins, or to flatten the balls before baking for a more classic snickerdoodle cookie shape. 1. Preheat the oven to 350° F. Line a baking sheet with parchment paper. 2. Prepare the flax egg by mixing ground flaxseed with water in a small cup, whisk briefly and set aside. 3. In a medium bowl, whisk all of the dry ingredients until uniform. 4. In a large bowl, cream all of the wet ingredients and the flax egg (try to break up the banana clumps – you can also pulse this mixture in a food processor for the smoothest results). 5. Add dry ingredients to wet, mix with a spatula until just combined. If the mixture is too dry, add 1-2 Tbsp of non-dairy milk. Don’t overmix – the cookies may come out gummy when the dough is overmixed. 6. To make the coating, mix granulated sugar with cinnamon on a small plate. 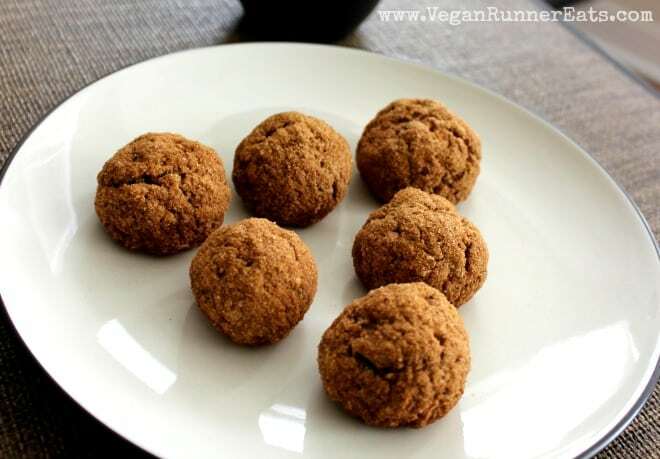 Form little balls from about ½ Tbsp of dough, dip each ball into the cinnamon sugar and place on the lined baking sheet. Repeat until all of the dough is used up. You may end up with leftover cinnamon sugar – keep it for the next time you’re baking something. 7. If you want the baked cookies to be flat, flatten each ball of cookie dough with your thumb; if not, just leave them as is. 8. Bake at 350° F for 12-13 min, then let cool for a few minutes before eating. Enjoy! You may have noticed that this recipe has a different look from all of the recipes I’ve previously posted. The truth is, I’ve been having trouble with the recipe plugin (kind of like a recipe writing app for blogs) that I normally use on my site: if this plugin is active, you can see all of the recipes on my site, but I can’t add a new post; if I deactivate the plugin, I can write a post, but you can’t see my recipes in the meantime. Are there any bloggers reading this who use ZipList recipe plugin and experience the same? Or any tech gurus with a taste for vegan cookies? I’d love to hear your thoughts! Anyway, enjoy the cookies, and have a great weekend! Carbohydrates or Fat: Which One Makes Us Pack On the Weight? Tagged bananas, cookies, vegan dessert, whole grains. Bookmark the permalink. One thing I’d like to ask, my dough was quite sticky so I couldn’t really shape balls so my cookies came out a bit wonky. Is the dough supposed to be sticky or more on the dry side? ??? ?